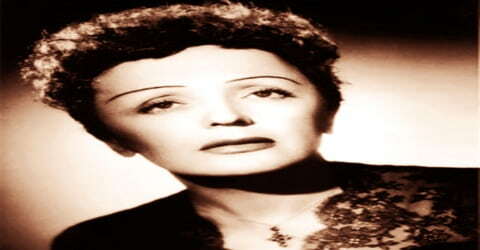 Edith Piaf – French vocalist, songwriter, cabaret performer, and film actress. A French singer and actress whose interpretation of the chanson, or French ballad, made her internationally famous, Edith Piaf was born on the pavement of Rue de Belleville 72, but her birth certificate cites that she was born on 19 December 1915 at the Hôpital Tenon, a hospital located at the 20th arrondissement. 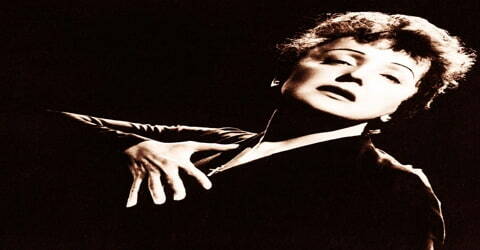 Piaf’s music was often autobiographical and she specialized in chanson and torch ballads about love, loss, and sorrow. Her most widely known songs include “La Vie en rose” (1946), “Non, je ne regrette rien” (1960), “Hymne à l’amour” (1949), “Milord” (1959), “La Foule” (1957), “L’Accordéoniste” (1940), and “Padam, padam…” (1951). Albeit her short physical stature, audiences the world over were amazed by her powerful vocals. Her music embodied the wretched life of the streets of Paris and was highly sentimental and passionate. Steeped in poverty and abandoned by her mother, she grew up with her grandparents until her father made her a part of his acrobatic show. Piaf had to earn her living singing on the streets of Paris. She was discovered by Louis Leplee who groomed her into a night-club singer. After he was murdered, she recruited Raymond Asso who gave her an image makeover and the basic education. She had an endless stream of lovers. After cementing her place in the world of music, she took upcoming musicians under her wings and groomed them. She was not formally educated, yet managed to pen the lyrics of quite a few of her songs. In spite of making it big in the world of music, she continued to suffer psychologically. She became addicted to morphine and alcohol, following a series of near-fatal accidents. Even today she continues to be heard by music lovers all over the world. Her style epitomized that of the classic French chanson: highly emotional, even melodramatic, with a wide, rapid vibrato that wrung every last drop of sentiment from a lyric. Piaf preferred melancholy, mournful material, singing about heartache, tragedy, poverty, and the harsh reality of life on the streets; much of it was based to some degree on her real-life experiences, written specifically for her by an ever-shifting cast of songwriters. Her life was the stuff of legend, starting with her dramatic rise from uneducated Paris street urchin to star of international renown. Early in her career, she chose men who could help and instruct her; later in life, with her own status secure, she helped many of her lovers in their ambitions to become songwriters or singers, then dropped them once her mentorship had served its purpose. 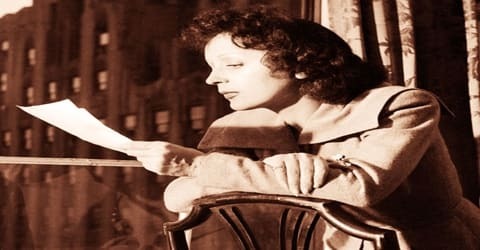 By the time cancer claimed her life at age 47, Piaf had recorded a lengthy string of genre-defining classics “Mon Légionnaire,” “La Vie en Rose,” “L’Hymne à l’Amour,” “Milord,” and “Non, Je Ne Regrette Rien” among them that many of her fans felt captured the essence of the French soul. Edith Piaf, by name of Édith Giovanna Gassion, was born on December 19, 1915, in Ménilmontant, one of the poorer districts of Paris. Her father was Louis-Alphonse Gassion, a street acrobat from Normandy and her mother was Annetta Giovanna Maillard, a cafe singer from Italy. She was named Édith after World War I British nurse Edith Cavell, who was executed 2 months before her birth for helping French soldiers escape from German captivity. Piaf – slang for “sparrow” was a nickname she received 20 years later. In 1929, at age 14, Piaf joined her father in his acrobatic street performances all over France, where she first sang in public. At the age of 15, Piaf met Simone “Mômone” Berteaut, who may have been her half-sister, and who became a companion for most of her life. Together they toured the streets singing and earning money for themselves. With the additional money Piaf earned as part of an acrobatic trio, she and Mômone were able to rent their own place; Piaf took a room at Grand Hôtel de Clermont (18 rue Véron, 18th arrondissement of Paris), working with Mômone as a street singer in Pigalle, Ménilmontant, and the Paris suburbs (cf. the song “Elle fréquentait la rue Pigalle”). In 1932, Edith Piaf met and fell in love with Louis Dupont. Within a very short time, he moved into their small room, where the three lived despite Louis’ and Mômone’s dislike for each other. Louis was never happy with the idea of Piaf’s roaming the streets and continually persuaded her to take jobs he found for her. She resisted his suggestions until she became pregnant and worked for a short while making wreaths in a factory. In February 1933, the 17-year-old Piaf gave birth to her daughter, Marcelle (nicknamed Cécelle) at the Hôpital Tenon. Like her mother, Piaf found it difficult to care for a child, as she had little maternal instinct, parenting knowledge, or domestic skills. She rapidly returned to street singing, until the summer of 1933, when she opened at Juan-les-Pins, Rue Pigalle. Marcelle died of meningitis at the age of two. Piaf neither wanted nor had other children. It is rumored that Piaf slept with a man to pay for Marcelle’s funeral. Edith Piaf had an affair with a former middleweight world champion, Marcel Cerdan, who was already married. He later passed away in a plane crash, while traveling from Paris to New York to meet her in October 1949. In 1951, she broke her arm and two ribs in a car crash. Her injuries were further aggravated when she was involved in two more near-fatal accidents. She became addicted to morphine and alcohol. Edith Piaf married Jacques Pills (real name René Ducos), her first husband, in 1952 (her matron of honor was Marlene Dietrich) and divorced him in 1957. In 1962, she wed Théo Sarapo (Theophanis Lamboukas), a Greek hairdresser-turned-singer and actor who was 20 years her junior. The couple sang together in some of her last engagements. Edith Piaf lived mainly in Belleville, Paris, with her father from 1915 to 1931. From 1934 to 1941, she lived at 45 rue de Chézy in Neuilly-sur-Seine; she lived alone from 1941 to 1952 and with Jacques Pills from 1952 to 1956. She continued to live there alone from 1956 to 1959. In her final years, she lived at 23 rue Édouard Nortier in Neuilly-sur-Seine alone from 1959 to 1962 and with Théo Sarapo from 1962 until her death in 1963. In 1935 Edith Piaf was discovered by Louis Leplée, a cabaret owner, who gave her her first nightclub job. It was Leplée who began calling her “la môme piaf,” Parisian slang for “little sparrow,” in an apparent reference to her diminutive size under 5 feet (142 cm) tall and about 90 pounds (40 kg) in weight. She later adopted the name professionally. Her debut was acclaimed by the actor Maurice Chevalier, who was in the audience that night. Leplée ran an intense publicity campaign leading up to her opening night, attracting the presence of many celebrities, including actor and singer Maurice Chevalier. The bandleader that evening was Django Reinhardt, with his pianist, Norbert Glanzberg. Her nightclub gigs led to her first two records produced that same year, with one of them penned by Marguerite Monnot, a collaborator throughout Piaf’s life and one of her favorite composers. 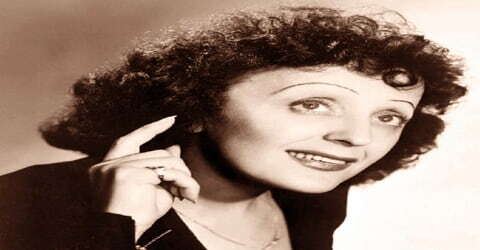 In January 1936, Piaf cut her first records for Polydor, “Les Momes de la Cloche” and “L’Étranger”; the latter was penned by Marguerite Monnot, who would continue to write for Piaf for the remainder of both their careers. On 6th April 1936, Leplee was murdered. Piaf was arrested and later acquitted. Her reputation was ruined. She recruited Raymond Asso to give her an image makeover. He gave her the stage name, ‘Edith Piaf’. In 1940, Piaf co-starred in Jean Cocteau’s successful one-act play Le Bel Indifférent. The German occupation of Paris did not stop her career; she began forming friendships with prominent people, including Chevalier and poet Jacques Bourgeat. She wrote the lyrics of many of her songs and collaborated with composers on the tunes. Spring 1944 saw the first cooperation and a love affair with Yves Montand in the Moulin Rouge. She was his mentor and lover until she broke off with him after he became famous. By this time, Piaf became quite famous in France. She started touring all over Europe, the US, and South America. She helped the Argentine folklore singer, Atahualpa Yupanqui, and Charles Aznavour built their careers. In January 1937, Piaf recorded “Mon Légionnaire” for a major hit, and went on to cut the Asso/Monnot collaborations “Le Fanion de la Légion,” “C’est Lui Que Mon Coeur a Choisi” (a smash hit in late 1938), “Le Petit Monsieur Triste,” “Elle Frequentait la Rue Pigalle,” “Je N’en Connais Pas la Fin,” and others. Later that year, Piaf made concert appearances at the ABC Theater (where she opened for Charles Trenet) and the Bobino (as the headliner); the shows were wildly successful and made her the new star of the Paris music scene. In the mid-1940s Edith Piaf became a mentor to the young Yves Montand, and she worked with him in the film Étoile sans lumière (1946; “Star Without Light”). She had an affair with the middleweight boxer Marcel Cerdan, who died in a plane crash on his way to meet her. Her unhappy personal life and unadorned though dramatic style underlined her expressive voice, and she was able to move audiences with her passionate rendition of songs that were often about loss and love. In her later life, Piaf was involved in several serious car accidents, and she suffered from failing health, partly due to alcohol and drug abuse. In 1947, Edith Piaf wrote the lyrics to the song “Mais qu’est-ce que j’ai ?” (music by Henri Betti) for Yves Montand. Within a year, he became one of the most famous singers in France. She broke off their relationship when he had become almost as popular as she was. During this time, she was in great demand and very successful in Paris as France’s most popular entertainer. After the war, she became known internationally, touring Europe, the United States, and South America. After a glowing 1947 review in the New York Herald Tribune by the influential New York critic Virgil Thomson, himself a contributor to international avant-garde culture, however, her popularity grew, to the point where she eventually appeared on The Ed Sullivan Show eight times and at Carnegie Hall twice (1956 and 1957). In early 1950, Piaf recorded “L’Hymne à l’Amour,” a tribute to the one lover Piaf would never quite get over; co-written with Marguerite Monnot, it became one of her best-known and most heartfelt songs. She helped launch the career of Charles Aznavour in the early 1950s, taking him on tour with her in France and the United States and recording some of his songs. At first, she met with little success with U.S. audiences, who expected a gaudy spectacle and were disappointed by Piaf’s simple presentation. 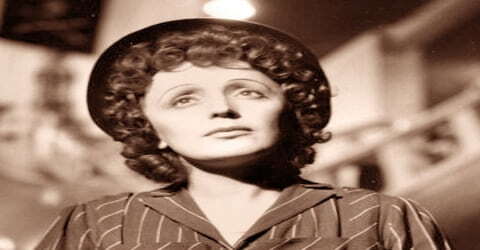 Edith Piaf performed in various nightclubs and brothels, which flourished during the 1940-1945 Années Erotiques (book title of Patrick Buisson, director of the French history channel). Various top Paris brothels, including Le Chabanais, Le Sphinx, One Two Two, La rue des Moulins, and Chez Marguerite, were reserved for German officers and collaborating Frenchmen. She was, for example, invited to take part in a concert tour to Berlin, sponsored by the German officials, together with artists such as Loulou Gasté, Raymond Souplex, Viviane Romance and Albert Préjean. In 1942, Piaf was able to afford a luxury flat in a house in the fancy 16th arrondissement of Paris (today rue Paul-Valéry). She lived above the L’Étoile de Kléber, a famous nightclub and bordello close to the Paris Gestapo headquarters. As an interpretive singer, Piaf was at the height of her powers during the mid-’50s, even in spite of all her health woes. Her international tours were consistently successful, and the devotion of her massive French following verged on worship. She scored several more hits over 1956-1958, among them “La Foule,” “Les Amants D’un Jour,” “L’homme à la Moto,” and the smash “Mon Manège à Moi.” During that period, she also completed another stay in detox; this time would prove to be successful, but years of drug and alcohol abuse had already destabilized her health. 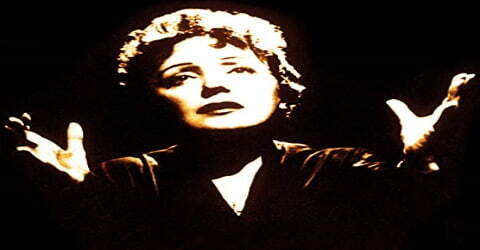 Edith Piaf gave many memorable performances in Bruno Coquatrix’s Paris Olympia music hall. In 1961, she helped to save the hall from bankruptcy by offering debut performance of her song, ‘Non, je ne regrette rien’. Her last song, ‘L’Homme de Berlin’ was recorded in April 1963. This soulful singer was left-blind due to keratitis at childhood. Piaf allegedly had miraculous healing when she was sent on a pilgrimage to honor, ‘Saint Therese’ of Lisieux. 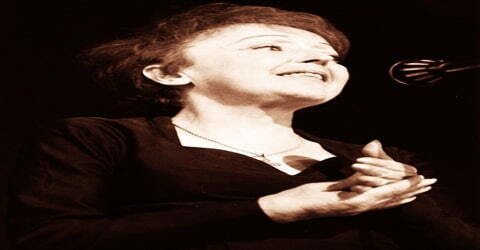 Edith Piaf’s signature song, “La Vie en rose”, was written in 1945 and was voted a Grammy Hall of Fame Award in 1998. She won Grammy nominations for ‘Best Album Cover (other Than Classical) Award’ and for ‘Best Album Notes Awards’. 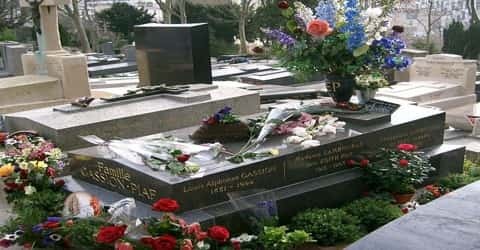 Edith Piaf died of liver cancer at age 47 at her villa in Plascassier (Grasse), on the French Riviera, on 10 October 1963, the day before filmmaker and friend Jean Cocteau died. Her last words were “Every damn thing you do in this life, you have to pay for.” It is said that Sarapo drove her body back to Paris secretly so that fans would think she had died in her hometown. She is buried in Père Lachaise Cemetery in Paris next to her daughter Marcelle, where her grave is among the most visited. Buried in the same grave are her father, Louis-Alphonse Gassion, and Théo (Lamboukas) Sarapo. The name inscribed at the foot of the tombstone is Famille Gassion-Piaf. Her name is engraved on the side as Madame Lamboukas dite Édith Piaf. Piaf was not given a funeral mass by the Archbishop of Paris owing to her lifestyle. Her funeral procession was attended by a huge crowd. Charles Aznavour recalled that Piaf’s funeral procession was the only time since the end of World War II that he saw Parisian traffic come to a complete stop. A museum has been built in her memory called the Musee Edith Paif. Her songs appear in many movies such as Saving Private Ryan, Inception, Bull Durham, La Haine, The Dreamers and Madagascar 3. In addition to singing, Piaf recorded her thoughts about her life in two books, Au bal de la chance (1958; “At the Ball of Fortune”; Eng. trans. The Wheel of Fortune) and the posthumously published Ma vie (1964; My Life). She was the subject of several biographies as well as plays and movies. Movies made on her life include ‘Paif’, ‘Edith et Marcel’, ‘Piaf…Her Story…Her Songs’ and ‘La Vie en Rose’. A biography on her life was written by David Bret called ‘Piaf, A Passionate Life’. Among her most popular songs are “Mon legionnaire”, “Hymne a l’amour”, “Sous le ciel de Paris”, “Milord” and, probably the best known, “Je ne regrette rien”, all of which catapulted her to great fame.